Date 24/05/2017. 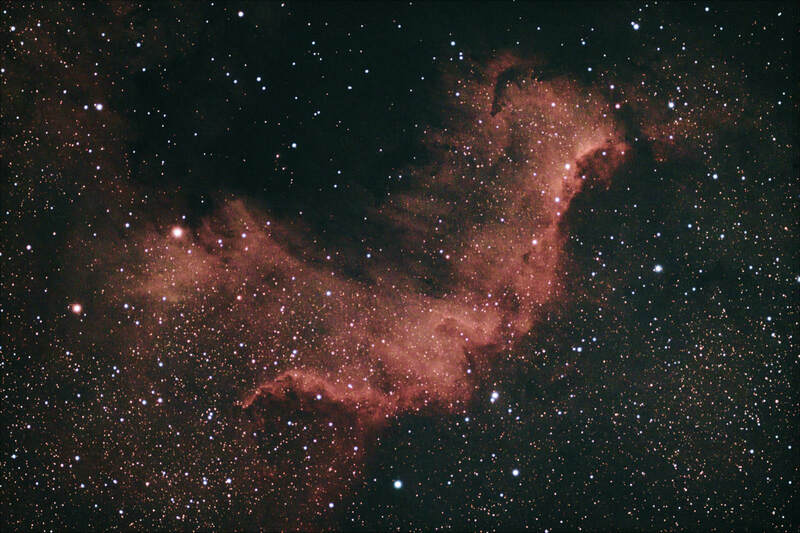 Part of the North American Nebula. Weather: Probably the best conditions I have ever had imaging, very still atmosphere and clear skies. The guide scope stayed on target the entire night. Settings: 58 x 3 minute lights, 50 darks from library, 50 flats taken recently and 50 bias frames. ISO 800. Processing: The Lights and calibrations frames were processed using Deep Sky Stacker. I set the star detection thresholds to values that caught about 60 stars. The final images were stretched in RGB and I then balanced the histograms to retain white balance. Luminance was tweaked to show faint detail. I also used Gimp to add a selective Gaussian blur over a 5 pixel range to blend the RGB noise.